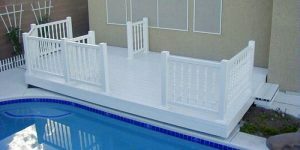 If you are interested in looking into a deck, we recommend you contact us. We have many years experience with the different types of decks such as Trex decks, Brock decks, wood decks, and vinyl decks, and can show you the advantages & disadvantages of each. Trex decks, for example, come with a manufacturers 20 year warranty. Their composite material is guaranteed not to splinter and never needs to be painted. It will never warp, crack, or peel. Compliment this deck with our vinyl railing and alumawood patio cover to create an excellent look for your home. 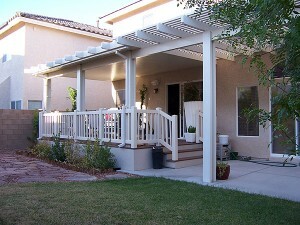 We have built many decks in Las Vegas and Pahrump. We build decks and ramps for Government organizations such as "Rage", Rebuilding Together With Christmas in April, and Las Vegas Senior Lifeline. Call Las Vegas Patio Covers today for a free estimate !